What is the best types of Digital Asset Management for your organization? Out in the real world we find that actual DAM systems don’t always align exactly with these cut-and-dry categories. Most digital asset management systems focus on one area or have some natural overlap between the categories. Some don't have areas of specialty and try to do it all. For example some DAMs are focused workflow and creative process management tools. 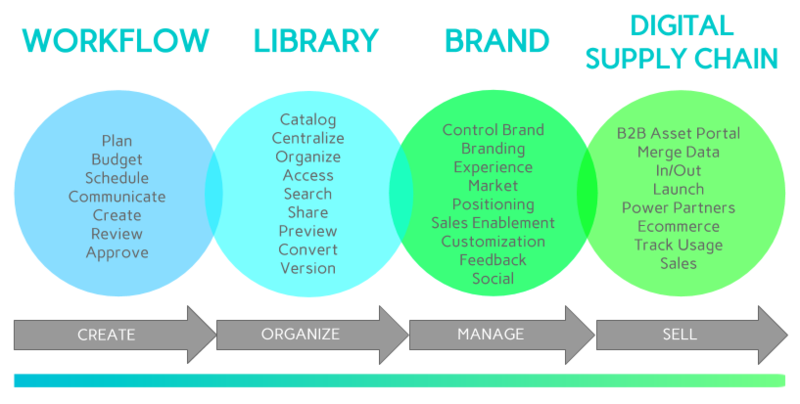 Library asset management is the most common form of DAM has been around for almost a quarter century now with its core functional foundation set long before the inception of digital marketing and ecommerce. In our simple infographic we help marketers by presenting the types of DAM in a visual continuum based on common workflows - starting at asset inception and ending at customer touch points. In an effort to find the best fit digital asset management system for a particular need, DAM shoppers could potentially place the DAM software they are considering on this continuum to better compare its capabilities to Amplifi.io or any others. In our graphic, we move from left to right starting with production to organization and cataloging assets and then to the right as they move through a normal share and deploy for commerce life-cycle. Creation on the left and customer experiences on the right. A system fully designed for creation and production (far left) may not have all the strengths of a system that is designed as an archival library (center). And a tool that focuses on digital supply chain (far right) may not have the strengths of a production focused system and so forth. Archival asset management (where assets need to be broadly searchable many years later), is going to have different features from a system designed to get short lifecycle marketing images to market as fast as possible. Knowing your goals, current bottlenecks and pain points as well as the typical lifespan of your assets will make choosing the right DAM much easier. Creative teams are like a fingerprint, no two are the same and workflows and digital systems can vary greatly. Many of these processes are highly specific and designed to meet specific needs of the organization that employs them. A common thread across all production is that the content is largely in-motion. Changing by the minute, new ideas surface and are acted on. Photographers are delivering new content, artists are making layouts, managers are looking at schedules, budgets, requirements, time-lines, and approvals. What a unique (and wonderful) mess this can be. Software dealing with the production phase has to be robust and accommodate vastly different workflows, communication, software and IT systems. Yes there are digital assets in there too. Some DAMs stretch into production in varying degrees. Some workflow specific software systems also offer aspects of digital asset management as they accommodate files in motion as they progress through the workflows. Think systems like; Glip, Slack, Basecamp, Workfront, Asana, Insightly, MS Project, etc. As assets are completed they stabilize, are finalized, and then need to be organized in a Library or Catalogue of content. This is where naming, folder making, tagging, associating files can take place. This phase has as its primary goal to store and retrieve large quantities of infrequently changing media assets. Some systems can manage long term assets and re-embed metadata back into the files themselves. For example, photo or video archiving, storing of product imagery, logos, marketing collateral and so forth. Traditional DAMs provide a secure home where all these digital assets can live. This category is pretty broad and may accomodate librarians and marketers. Moving to the right and also aligned with assets further on in a typical marketing asset life-cycle, is the category of Brand Management. Today, brands are working across many touch-points like digital, mobile and physical locations. and since media content now plays such an important role in brand marketing, specialized treatment and of brand and marketing content can be required. Needs may include establishing a brand-centric and easy-to-use content portal where additional information workers can quickly and efficiently find and share marketing media and other product information across diverse go-to-market people, partners, and programs. In the Digital Supply Chain category finished marketing assets, product lists, specifications, copy, messaging, and product information are prepared, converted and formatted to be shared out across diverse channels. In many cases, structured data needs to merge with other digital assets and flow out to various destinations. This commerce-centric flow is called 'digital supply chain' and extends the DAM's features into commerce where traditional DAM libraries don't cover. These are the four main types of digital asset management. Like in so many other areas, you can rarely have it all and determining the best focus for your DAM is the best first step. In a future post we will discuss selecting the best DAM for your organization.